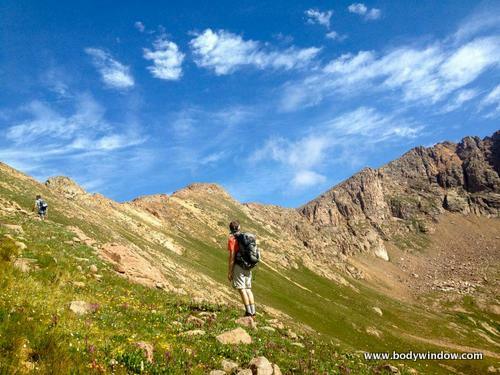 Jupiter Mountain, deep in the heart of the San Juans in Colorado, was to be our 100th Centennial Peak climb! 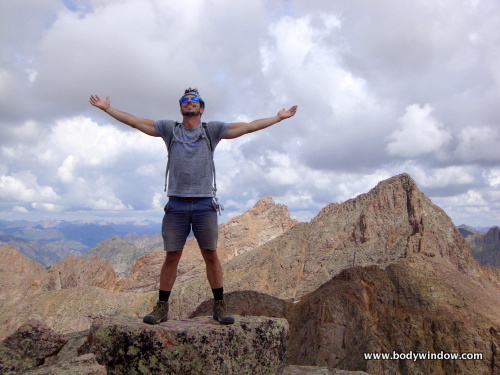 Standing at 13,830 feet, could we achieve our goal of reaching the highest 100 summits of Colorado, after 22 years of climbing in the Colorado Mountains? The anticipation was high among the seven in our group as we began the long drive from Denver, Colorado to the Vallecito Creek Trailhead, near Durango. The drive took us approximately 6.5 hours, and we were fortunate enough to secure a camping site for all of us, at the Vallecito Campground right at the trailhead. 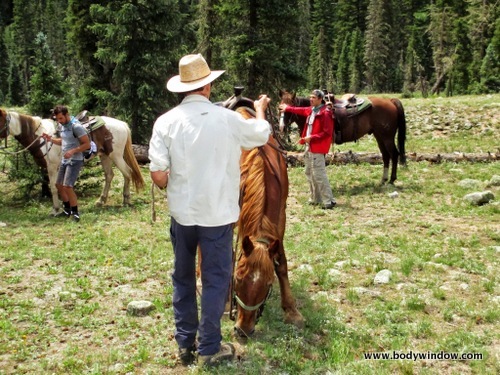 This Jupiter Mountain 100th Centennial Peak climb was to be a celebration, and to fit the occasion, we hired horses to ride in, and pack mules to carry our heavy packs, to high camp. What a luxury! If hunters can have a drop camp, why not hikers? The Vallecito Lake Outfitters that we hired were experienced in these matters. 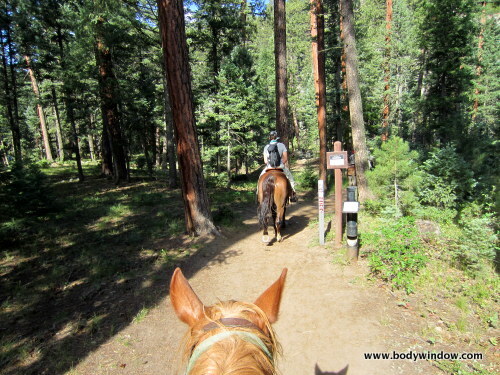 Here is the trailhead, clocking in at 7900 feet, where we settled onto our horses for the long ride in the great outdoors! 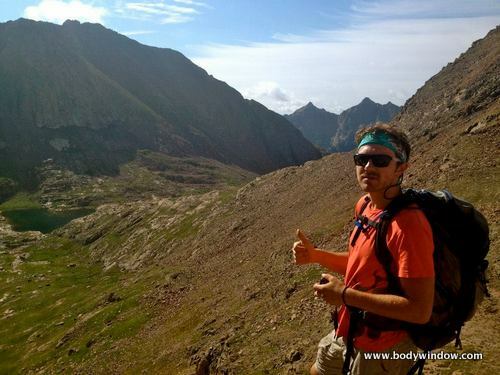 Our friend, Stryder, who was on our Vestal Peak climb last year, is all smiles! 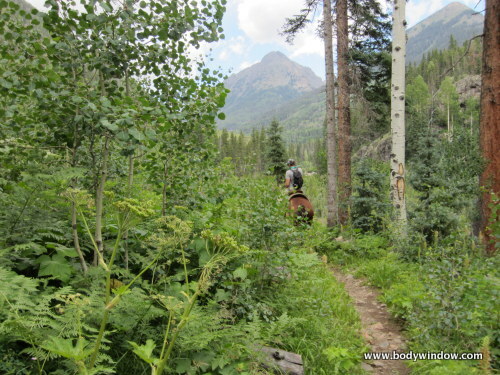 Initially, the Vallecito Creek Trail is very wide and easy. 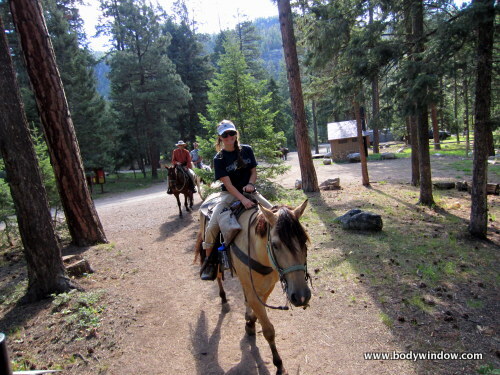 At the trailhead, Alex, my stepson, looks pretty comfortable on his horse, don't you think? 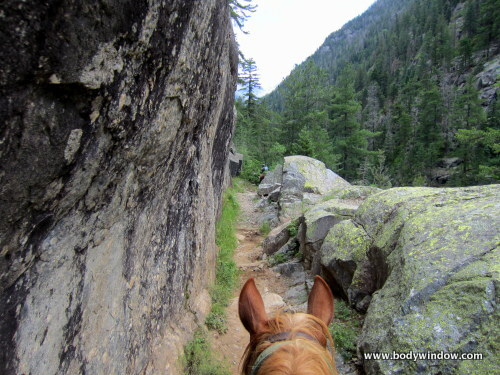 The Vallecito Creek Trail soon starts switch-backing up steeply as our sure-footed beasts negotiated the rock ledges. I actually had a mule! That's me in the red cowgirl hat. My mule was named Goldie and he was a very sturdy beast. I felt fortunate to have him. My friend Nadine's horse was leading the way. The trail negotiates some very interesting terrain, including this rocky passage as it travels along the Vallecito Creek drainage. My husband, Rich got the perfect shot going through this as he sat on his horse. 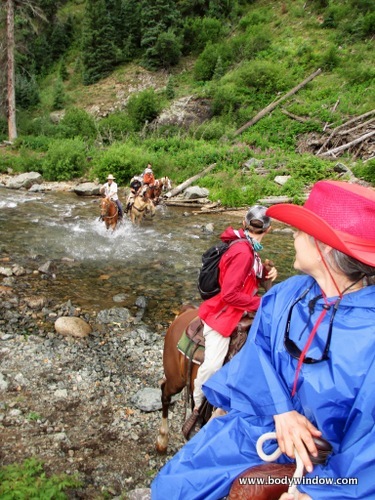 This is more of the beautiful scenery, showing our perch above the Vallecito Creek that we could actually enjoy, while riding on horses. No need to keep looking at our feet or struggle under a heavy load! A real treat for our Jupiter Mountain journey. 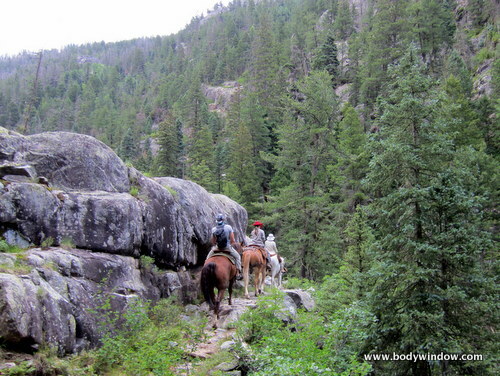 The Vallecito Creek Trail slowly and gently climbs for the 9.75 miles we traveled along it. This was a rainy year, and the vegetation was lush. 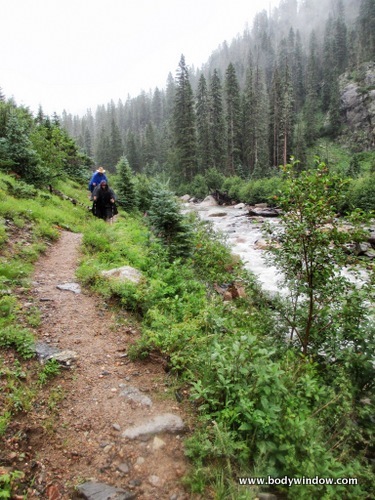 There is only one significant creek crossing, after the 3rd bridge as you head north up Vallecito Creek. Apparently there was a bridge here at one time that was wiped out by an avalanche. For us, on the ride, we did not have to take off our boots! 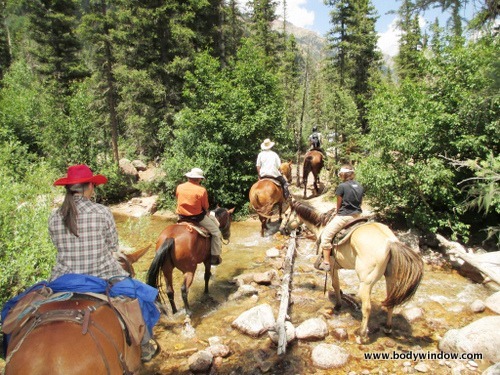 Some of the horses were tentative, but the crossing was no problem at all. It was quite fun on a horse actually! It had started to sprinkle a bit, hence my rain poncho, but not for very long. 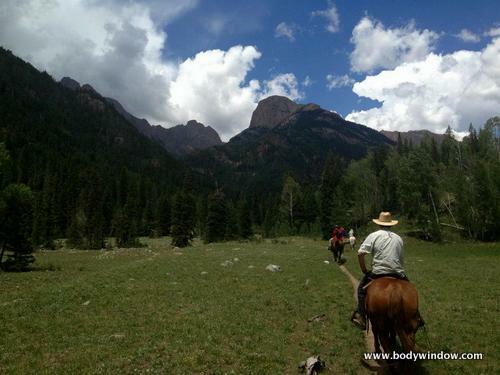 The trail soon opens up to lovely high meadows, and the mountain called "The Guardian" looms above, hinting of the lofty heights to come as we rode toward Jupiter Mountain! 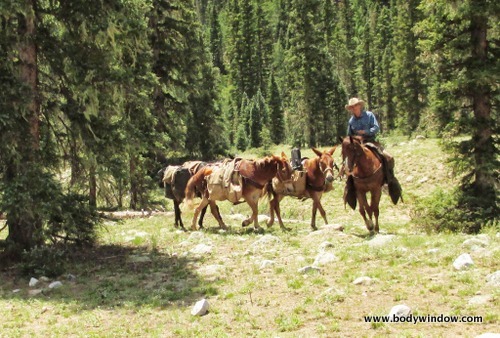 After the long ride to the Johnson Creek turnoff, and after crossing the bridge across the Vallecito Creek, there was a nice meadow, where we were able to dismount and get our land legs again! Unfortunately, I do not have a picture of the signpost and the bridge where you head for Columbine Pass and Jupiter Mountain, but it is very well marked and you can't miss it. My GPS said we had come 9.75 miles and it took about 3.5 hours to get here. I imagine it would have been at least another hour on foot with packs. 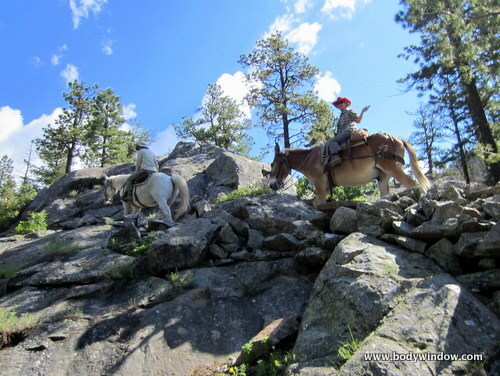 And always, just behind us, was John Clark, the Vallecito Lake Outfitter owner and wrangler, with our trusty pack mules, carrying up the goods. Yeah! Back in the saddle again, we crossed the Johnson Creek, heading still higher for a high camp. 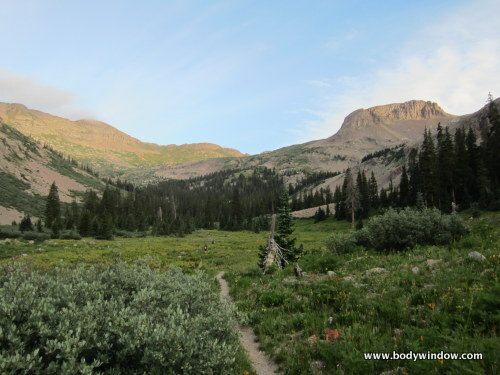 We went only 1.1 miles up the Johnson Creek drainage, and established our high camp at 9500 feet. It wasn't the best site, and we were to learn that there was an even better camping area about 4 more miles up. I felt that it would have been nice to gain higher ground. However, we decided to camp here. 11 miles to pack back out in two days, was enough. Here we are having our celebratory toast, for having made it thus far! All that effort, you see! From left to right are great friends, Norm Epp, then me, Elle, and Nadine Abrahams. Next is Ryan Burchell, great friend of my stepson, Alex, my husband, Rich, Alex, and another great friend of Alex,' Stryder Smothers. 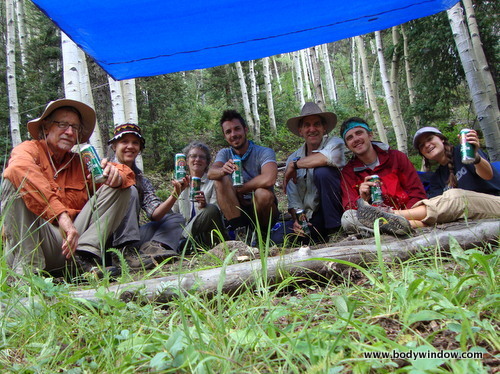 Since we had pack animals, the beverage cans were a real luxury! 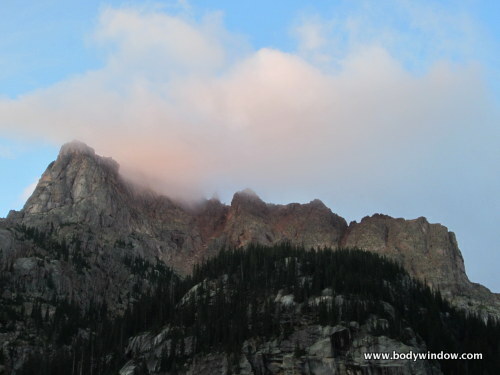 After a fitful night of sleep, anxious to get climbing Jupiter Mountain, we woke up at 4 am. We were on the trail by 5:15, thinking we would have about 6 miles to the summit. However, at 9500 feet for base camp, I knew the effort of a 4300 foot elevation gain would be significant. Here we all are in the early morning light, posing for a picture soon after we set out. Ryan was a pro at setting up the self-time so "everyone would be included." What a thoughtful guy. As always, the scenery was spectacular in the early morning, making me feel that being here was exactly where I was meant to be, to save me from "deadly apathy" as John Muir says. Here is Amherst Mountain, that would be our companion for many miles up the Johnson Creek drainage on our way to Jupiter Mountain. 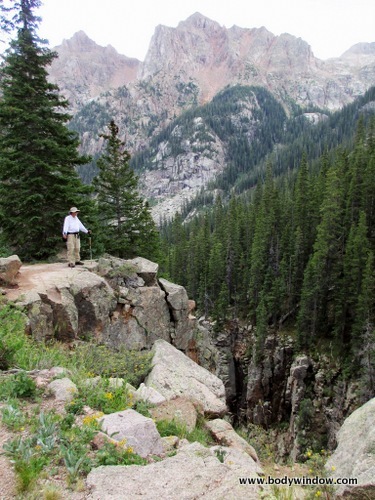 I did not check the mileage, but before long the Johnson Creek trail made a big bend, exposing this incredible gorge. 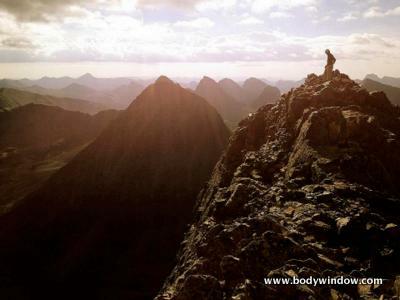 Norm is standing at the top of it, on the left, and if you looked down into the gorge, an amazing spire rose up. The bottom was a long way down. As the trail climbs ever higher, the unnamed Point 12,510 comes into view, as a large butte, on the right of this picture. The trail will switchback up high onto the left (south) shoulder of this point. 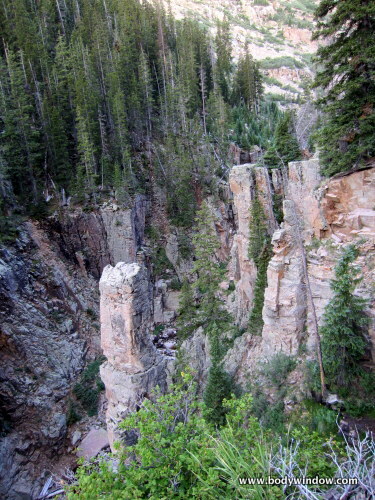 This is a great landmark to watch for on your way up to Columbine Pass or Jupiter Mountain. Here there are still trees, but not as thick now, as the trees open up to more and more alpine meadows. Here is Rich and I, now beyond Point 12,510 and above treeline. 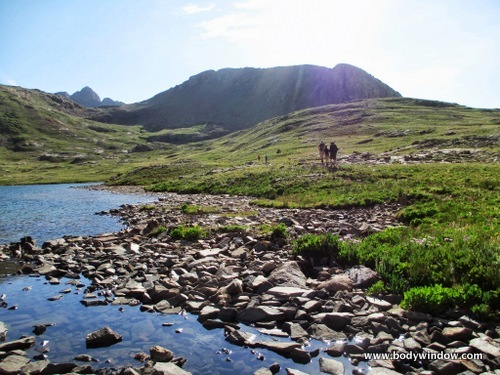 We are almost at Columbine Lake, which is just around to the right (north) at about 12,300 feet. 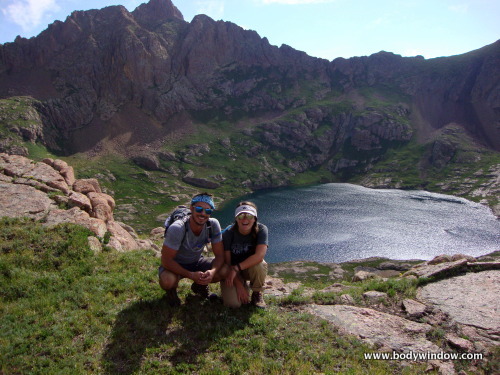 Once reaching Columbine Lake, shown below, Norm and Nadine decided to hang out in the alpine meadows, and maybe climb Columbine Pass. They were content to have no goal of climbing Jupiter Mountain. 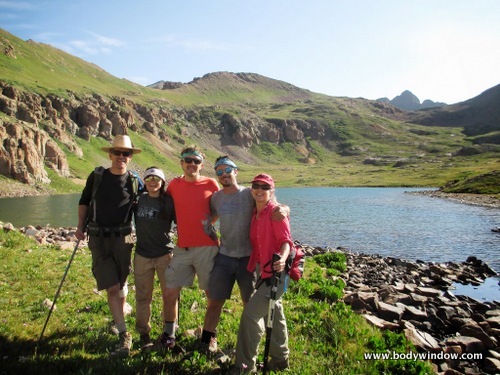 They wanted to look over the pass to Chicago Basin, and see the famous fourteeners, Eolus, Sunlight and Windom. 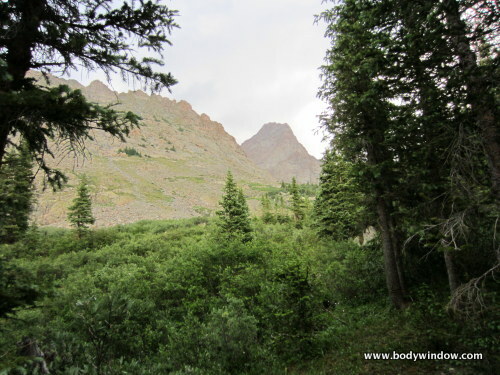 It was almost exactly 6 miles to Columbine lake, from our high camp, or about 7.5 miles from the Johnson Creek turnoff at Vallecito Creek. It was 8:45. Not too bad, but we had to keep moving. With the summit of Jupiter Mountain in sight, it all seemed like it was in the bag. Below is the picture of what we thought would be the "summit troupe," consisting of Rich, Stryder, Alex, Ryan, and I. Jupiter Mountain is just a blip, behind Point 13,155 and to the left. Point 13,155 is the prominent mound just above most of our heads in the middle of the photo. This photo, below shows the the saddle between Point 13,155 in the middle of the photo, and the appropriately named, Hope Mountain, out of the picture to the right. The peak behind the saddle is Grizzly Peak. This saddle to the northeast was our next goal. 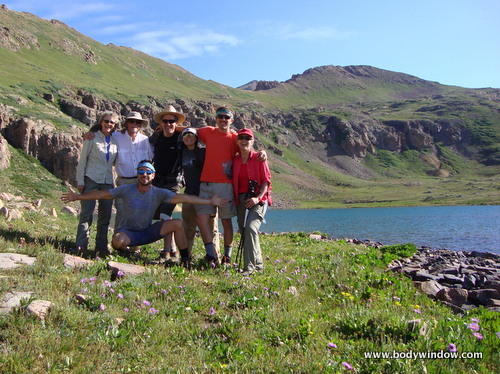 We chose to head for the Point 13,155/Hope Mountain saddle, by going around Columbine Lake to the east, instead of climbing Columbine Pass, which some trip reports suggest. 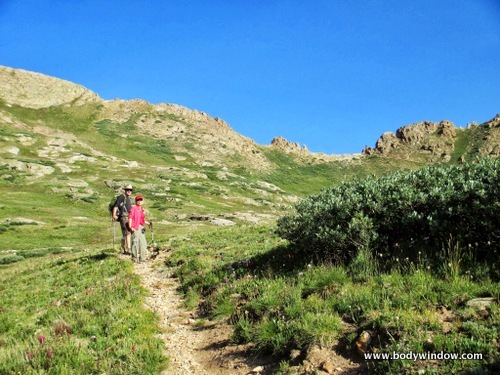 We would then head for the south ridge of Jupiter Mountain, via the Hope Mountain saddle. Here we are as we head towards the saddle, Hope Mountain looming above us. There was nice trail around the lake, which slowly fades out, then becomes apparent again, as it heads up toward old mines. Here is Ryan and Stryder, at the top of the Hope Mountain saddle, at approximately 12,800 feet, where the view of Hazel Lake under Grizzly Peak and Jupiter Mountain, suddenly appears. What a special place it is here! You are looking at Grizzly Peak in the photo. Jupiter Mountain is to the northwest, or the left, out of the picture. Here is a wonderful shot of Alex, beyond the Hope Mountain saddle, close to the south ridge, looking down toward Hazel Lake. That is McCauley Peak to the left. Staying high, as we looked to the north, we could now see the south ridge that lead to the summit of Jupiter Mountain. From this vantage point, shown in this photo, below, it looked very doable. We decided to do an ascending traverse, angling toward the ridge. 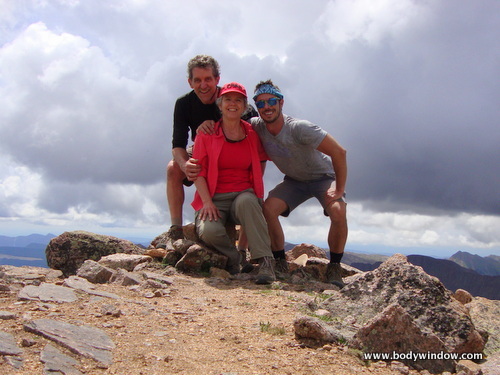 Once reaching the ridge, we climbed higher, now above the wonderful 13,000 foot benchmark. However, it soon became apparent that the ridge was not the way we were going to get to the summit. After scrambling over one hump on the ridge, that was rather easy, we came to the second hump, just above Alex's head in the picture above, that was beyond class 5 climbing. In other words, it would be a technical climb. The challenges of this hump are not apparent in the photo. There is a very steep drop off on the other side. Do not be fooled! Now, I had read at least two trip reports on the mountaineering sites, which assured me that the south ridge above point 13,155 never presented more than class 3+ climbing, meaning it was not technical. This bad information was very frustrating, as we had no ropes, no gear to get across the ridge at this point. My husband is an experienced climber, and I'm not so green myself, so it was not a matter of not having the skills required. To make matters worse, we could see ahead to the next hump in the ridge, and it also looked technical. We were at about 13,200 feet, with the summit oh so close, yet so very far away. We sat at our high point, pondering the best tactic now. To return the way we came, losing elevation, hike up and over Columbine pass, to descend yet again, another 1000 ft. into Chicago basin and then back up again seemed too long. It was about 10:30 and this did not seem like a wise decision. Finally, it became apparent, after studying the south face, that the only way, was to descend back towards Hazel Lake and do a direct assault on the south face of Jupiter Mountain. Here is the south face in all its glory. Does it look doable to you? We descended quickly toward Hazel Lake on grassy slopes. We did not descend all the way to the lake, but did a descending traverse, keeping as much of the elevation as we could, without increasing the difficulty too much. 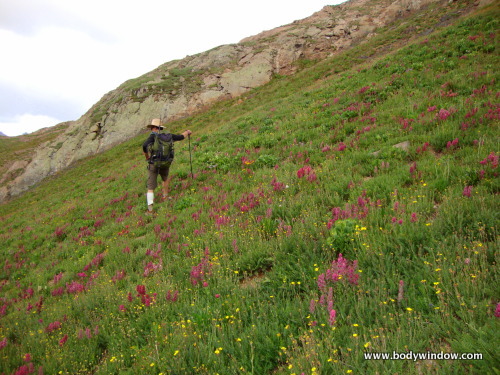 The photo below is how the grassy slopes looked, however, it actually shows Rich heading back toward the Hope Mountain saddle, on the trip out. But I wanted to include this photo because the amazing wild flowers on the slope actually gave me hope, courage and the stamina to keep going after the major disappointment on the south ridge. The descent was discouraging to say the least! However, Stryder was not convinced we could climb the south face. 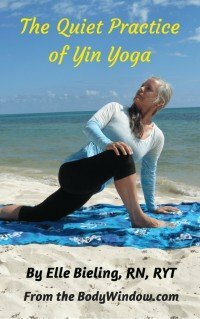 She no longer had the heart to keep going. It was now 7 miles into the climb, and the raw fact was apparent. One would have to reverse this trip back to camp which would make an extremely long day. While it was only a half mile to the summit, after dropping down we still had about 800 feet of vertical left. Looking at the south face, I estimated it would be at least another hour to the summit. Stryder decided to turn back. Since no one hikes alone, Alex agreed to turn back with her. It was decided that Ryan should hang with the old ones, to help out if needed. This would prove to be the right decision. The storm clouds were building and the south face looked formidable. We could see the look of concern in Alex' eyes. But we pressed on, Ryan, Rich and I. The goal was too near and so far this had required too much effort to not give it a try. 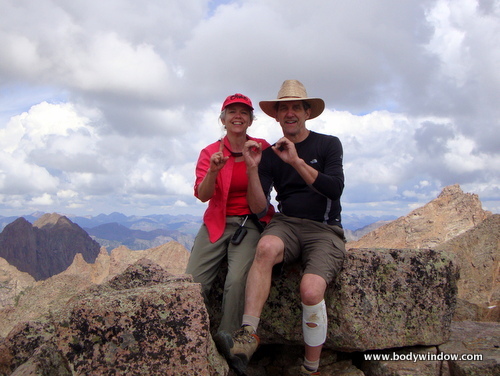 We just had to make our 100th centennial peak summit! I did not want to have to return another day! I was also encouraged, because I had remembered reading one trip report that a man and his 52-year-old father had done, also attacking the south face. I thought, if they could do it, so could we. 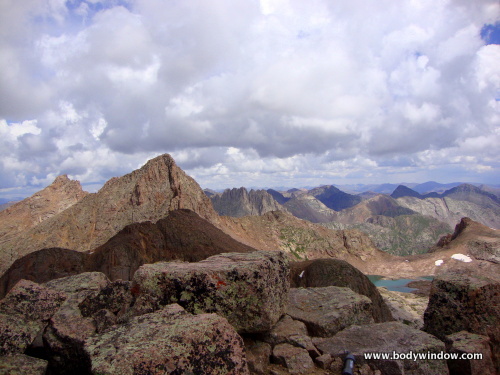 Here is the route we took into the south face of Jupiter Mountain to rejoin the south ridge at skyline, in the photo. The summit is to the left of the middle at skyline. From under the south ridge, we traversed across all the talus that was surprisingly stable, heading for a prominent 10-foot wide chute, just to the right of the grassy area where it meets the talus.This chute seemed to be the only reasonable way through the lower cliff bands. As you climb into this chute, it looks as if you should head straight up. Don't do this! Rich topped out in here, and with me following, yelled for me to head up to the left. I looked left and lo and behold, some nice grassy ledges appeared, and I easily scrambled up them. And shock and awe, there was a cairn marking the top of the chute! Someone had definitely gone this way. My hopes soared - briefly. Meanwhile, Rich was stuck. Ryan, coming up behind me, had to stay below and talk him back down from his perch, calling out the next foothold, as he inched his way back down. I was pretty paralyzed with fear, not being able to see the progress. I would call to Ryan, asking, "Is he halfway down yet?" "Is he close yet?" Bless his heart, Ryan would answer me, with confidence and no fear. When they both scrambled up to my perch, at least 15 extremely long minutes later, I was overcome with emotion. I grabbed Ryan's hand and held on in tears of gratitude! Ryan said later that we was perched at the bottom of the chute, ready to brace himself to break Rich's fall if needed! While Rich would not have died if he had fallen that 30 feet or so, he would have been hurt pretty badly! Bless Ryan! It felt like he was destined to be with us on this trip. My heart was weak from the effort of the climb, and I don't know if I could have kept as cool a head as he did! From the top of the chute, the route to rejoin the south ridge was apparent. We did an ascending traverse through grassy slopes to the northwest, to a small saddle just below a prominent hump, to the ridge. From here, the ridge was straightforward and easy. Quickly, we approached the false summit, legs burning. From the false summit to the true summit is a scramble on exposed rock ledges. We have no pictures of the summit ridge, since we were all too tired by this time to take them. All I can say it that it was exciting, and with a little rain, it would be very treacherous. We finally summited at just before noon, a full 7.5 hours, 8.66 miles and close to 5000 vertical feet with detour, from high camp. It was much later than we had hoped, and the clouds were building as you can see in the photos below. I cannot express the emotions that I felt upon finally reaching the summit. It was a mixture of relief, extreme fatigue and sheer joy, as I reached this goal that I thought I would never see that day. I sort of panted and groaned and cried, all at the same time!! We hugged each other and yodeled as loud as we could, in the event that Alex, Stryder, Norm or Nadine were in earshot! Unbelievably, after we signed the summit register, naming Jupiter as our 100th centennial peak, we saw that another man, only several days earlier had signed that he too, had made this his 100th summit! From Columbine Lake, the summit of Jupiter Mountain is only 1.71 miles (I clocked it on the return trip) and about 1500 feet elevation, if you were to take the direct route up the south face. It took us one hour and 50 minutes to return to the lake from the summit, with a long traverse through the rough terrain. 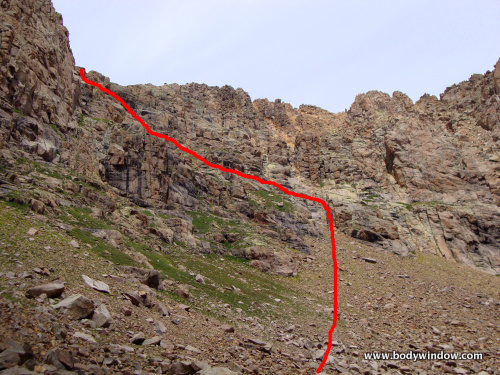 I am guessing that it would have taken at least 2 hours or more to have climbed this same route from Columbine Lake. All-in-all, from the turnoff at Johnson Creek from the Vallecito Creek Trail, the summit of Jupiter Mountain is 9.21 miles, and 4680 vertical feet away (according to my GPS). Add 9.75 miles from the Vallecito Creek trailhead at 7900 feet and 1220 more vertical feet, for a total of 19 miles, and 5900 vertical! A long, long way to go! Our Fingers Spell "100" on top of Jupiter Mountain! Ryan's expression in the photo below, says it all! We persevered, embraced the challenge and conquered the mountain. The world was our oyster! We were all overcome with joy! The views from the summit were unbelievable. 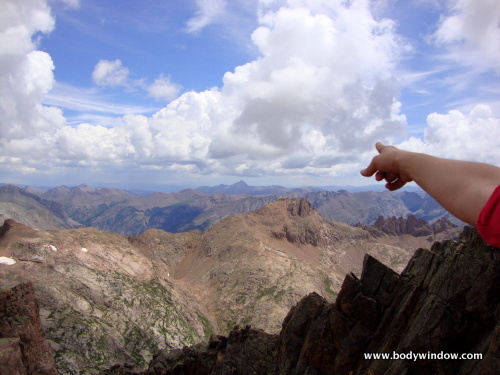 Here I am pointing out Rio Grande Pyramid, another Centennial Peak, above 13,800 feet that we climbed the year before. 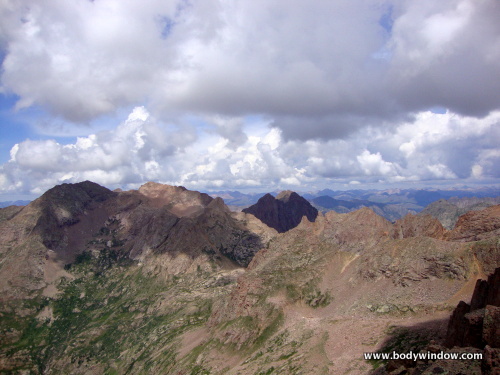 In this picture looms the famous fourteeners, Sunlight Peak, left and Windom Peak, to the right. In the middle, in the background is Jagged Mountain, another centennial thirteener that we climbed two years before. And finally, here is Eolus, and North Eolus, a fourteener and it's sub-peak, on the left and Pigeon and Turret Peaks, in the clouds to the middle. 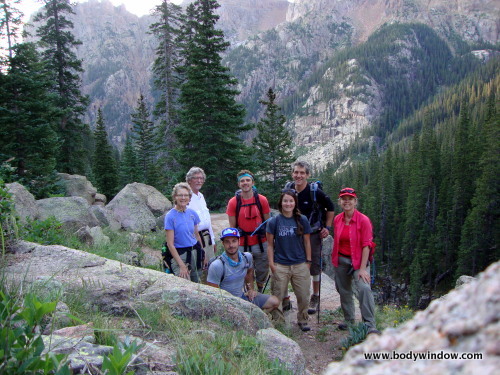 All included in the Centennial Peaks that we have climbed! We considered our options for the return off Jupiter Mountain and decided the most expedient path was to return the way we came up. After spending only about 15 minutes on the summit, quickly snapping photos, and eating a quick bite, we headed back down. The long hike back went much quicker that the climb up. There were thunderheads all around us, but we did not get rained on until the final one-half hour of the trip! We staggered back to high camp at 4:40 in the afternoon, exhausted and wet but joyful. My GPS clocked the return journey to base camp as 7.38 miles, shaving off 1.3 miles from the trip up. It also only took about 4.5 hours down, 3 full hours less than up. The rain turned out to be relentless that night. My camp-mates were all there to congratulate us and pamper us with a fire, warm soup and friendship that was true to the heart. I cannot ever recall a time in my life where I felt more love and support than in those moments when all of us had come together to help us meet our goal and to share in the celebration! To make the trip complete, my 55th birthday was the next day! My stepson, Alex had baked me a "brownie" cake that he managed to get in, replete with candles! That night we celebrated both my birthday and our successful 100th Centennial Peak climb! 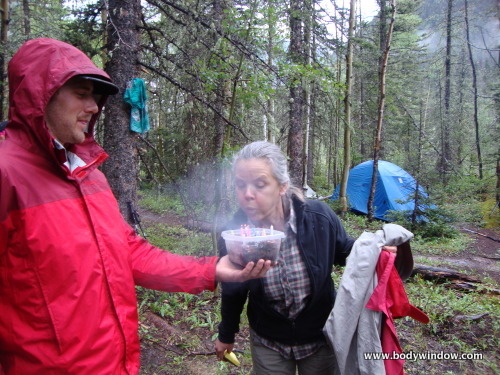 We woke up to a soggy camp on the 3rd day of our expedition, when we had to pack up for the long, 11.1 mile hike out. Fortunately, the hike out, though long and rainy the whole way, wasn't very steep and we made quick time of it. It took us 5.5 hours on the 11 mile return. 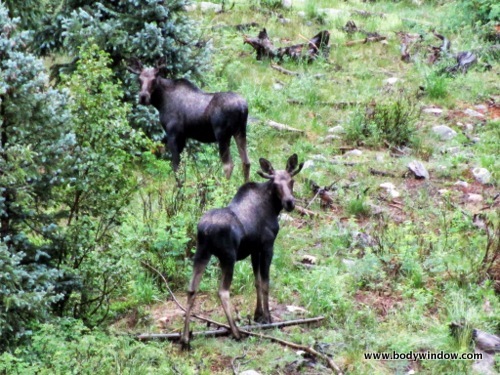 We even saw two young bull moose along the Vallecito Creek! We made it out by early afternoon, as the sky cleared up, finally, for the long drive back to Denver, and real life. I want to extend my sincere thanks to my friends, Norm, Nadine, Ryan and Stryder, and my family, Rich and Alex and to the Heavens for perfect weather that held out for our climb, for the warmth, love and support that was given to Rich and me, and for our health that made this all possible. May we have many more journeys together! Climbing Jupiter Mountain was a very special time in my life, that will never, ever be repeated!